Posted By:Unknown | At:9:53 AM Be the first to comment! It’s a heartbreaking, but often understated, reality that America’s criminal justice system imprisons black folks at astonishingly high rates. 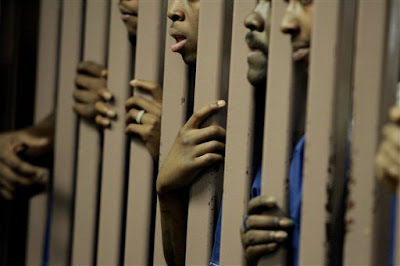 The U.S. Bureau of Justice estimated that as of 2008, there were over 846,000 black men in prison, making up 40.2 percent of all inmates in the system. But in a recent talk, noted author Michelle Alexander put those numbers in grave historical perspective. “More African American men are in prison or jail, on probation or parole than were enslaved in 1850, before the Civil War began,” Alexander, an Ohio State law professor, recently told listeners at the Pasadena Branch of the American Civil Liberties Union. Alexander’s seminal book, “The New Jim Crow: Mass Incarceration in the Age of Colorblindness” argues that prisons have become the latest form of economic and social disenfranchisement for young folks of color, particularly black men. In it, she grapples with a central question: If crime rates have fluctuated over the years and are now at historical lows, then why have rates of incarcerated men of color skyrocketed over the past 30 years?